The custom scripts app on PayWhirl lets you include 3rd party scripts on your widgets, payment forms and/or customer portal pages. The custom scripts app on PayWhirl has MANY uses. It can be used to CUSTOMIZE any of the pages PayWhirl provides, from widgets, to the cart & checkout flow, to the customer portal, and much more. The app also allows you to include 3rd party CONVERSION or TRACKING scripts on widgets, payment forms or after completed checkouts. NOTE: If you have multiple tracking scripts, you can install as many custom script apps as you need, or add multiple scripts to a single app. Once you have installed the app successfully you will see two different tabs on the settings page. One section will load scripts on EVERY PAGE PayWhirl provides and the other section will only load scripts AFTER CONVERSIONS, when people complete checkout successfully. 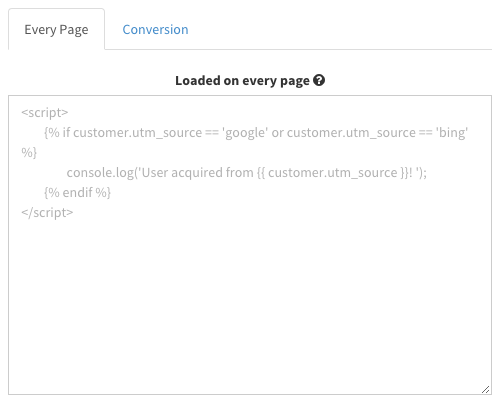 Typically the service you are using for tracking will provide a snippet of code that needs to get run on "Every Page" or just after "Conversions". Make sure to paste the code in the correct tab, including <script> tags. PayWhirl also provide variables (information from your customers & checkout data) to help you customize your tracking scripts and/or inject data into scripts as needed. You can also use jQuery to customize, animate and/or style pages within PayWhirl as needed... Finally, after loading conversion or tracking scripts you can optionally forward customers to a specific thank you page if you'd rather not direct customers to your customer portal after a purchase. NOTE: If you are not familiar with how to edit the code to include the variables we provide, you may need the help of a developer to get scripts working correctly.